Welcome to the First Our Daily Bread designs Blog Hop of 2010! If you got here from Kathy's Blog, you are in the right place! If not, you might want to go back to the Our Daily Bread designs blog and start the hop from there! We are kicking off the new year with the release of three new sets, perfect for Baptisms, Confirmation, and New Baby cards! Three blessed hoppers will be chosen randomly to receive One Set of THEIR CHOICE! All you have to do to be eligible to win is complete the hop, leaving comments on each blog and returning to the ODBD Blog and leaving your answer to the question there by Monday, Jan. 4 at 8PM EST. The question will be posted on the ODBD blog, but here's a tip.. as you are hopping along, take note of your favorite set and what you like best about it! Did I mention there will beTHREE WINNERS?!! One of the big changes that we are so excited about is that Our Daily Bread designs has accepted a position as a Member Company on Splitcoaststampers! Please visit the ODBD Welcome Forum and leave a comment by January 10! If you do, you will be entered into a drawing to win a $50.00 Gift Certificate to the ODBD Store! We have lots of things planned including Challenges and a special Prayer Request area! I hope to chat with you over on the ODBD Forum on SCS! Speaking of Challenges, we will be having a weekly challenge! The weekly challenge will be posted on the SCS Forum as well as the ODBD Blog. That means more prizes and awards, and fun for all!!! More on that shortly... stay tuned to the Our Daily Bread designs blog and the SCS Forum for further details. For now... just be sure to be back on Jan 9 when our first Challenge of the New Year will kick off! This picture really needs to be enlarged (click to enlarge) to be appreciated... I just could not get a good photo of it! I had gotten this beautiful frame from Hallmark when they were on sale and I knew there would be a perfect time to use it. This seemed the perfect time! I used parts of two new released sets from Our Daily Bread designs: Confirmation, and Baptism / Confirmation Verses. I stamped the image and sentiment on Papertrey Vintage Cream with Brilliance Platinum Planet ink. It's beautiful ink... silvery, yet not as strong as silver... almost a champagne cast to it. I love it but it sure is hard to photograph!!! LOL! The designer paper is SEI "Chocolate" and it's also a shimmery grayish silvery color with a touch of gold. I can't capture the shimmer at all! I used a Spellbinder's Lattice Edge Die Cut to cut Bazzill Gray and trimmed the image with ZVA Creative Pearls. I hope you are enjoying the blog hop today, and that you will be inspired by all the possibilities of these new sets! Thank you for stopping by! From here hop to Chris to see what great inspiration she has for you today! Have fun hopping, and Happy New Year from the Our Daily Bread designs Bread Basket! This is stunning Grace!!! I just love your use of the punches and pearls. A masterpiece wall hanging for sure!! Happy New Year!! Grace, this is absolutely gorgeous!!!! You are one classy lady, in every way!!! God Bless and Happy New Year!! This is just sooo stunning, Grace!! LOVE all the beautiful silver, and those pearls!! Your picture of it turned out wonderfully!! Happy New Year to you!! Grace is stunning! So unbelievably gorgeous! The details are amazing. Hope your New Years is blessed. Grace this is just stunning as usual. Your card is gorgeous. The color is so unusual. The way you put this card together is fantastic. The colors really come together. Thanks for sharing your art. Happy New Year and WOWZER - Grace!!! What an awesome looking frame!!! It's gorgeous...and I love all the details you added!!! INCREDIBLE, creative, classy, elegant and stunning in every way. LOVE YOUR Frame too! AMAZING work my friend. I love it! OH Grace!!!!! How beautiful this is!!!! You always amaze me!!!! Happy New year! What awesome work, Grace!! Exquisite!! Wow! I think I am at a loss for words on this one Grace! And that is no small feat! Elegance personified and you are right.It was the perfect time to use that gorgeous frame. Outstanding work as always but you have really outdone yourself on this beauty. TFS!!! Hugs!! Absolutely jaw dropping Grace! I LOVE that you've framed this gorgeous piece of art! Beautiful! Wow, I love the colors...very classic. Thanks for sharing. How divine that Chris Tomlin's song "Glory in the Highest" played along with this beautiful card of Glory at its highest!! Such beauty comes from within and how blessed we are that you share your awesome talents with us that so glorify our Lord!! This project is beyond beautiful. Thank you for sharing such a moving piece. Very beautiful card, and framing it, what a nice touch. scripture. The new sets sound exciting! Wow, just a GORGEOUS creation Grace! What a beautiful gift that would make and how stunning it would look in a home. Beautiful! OMGoodness!! How do you find the time to be our WONDERFUL DTC and still make such detailed and beautiful creations such as this frame?! You must be God's Superwoman!! Oh MY Grace! Words fail me, it's just such a stunning framed piece! Such beautiful detailed work to showcase this beautiful cross! What a beautiful wall hanging! Grace, you always do such lovely work, this is inspired. Truly amazing.........You are Amazing Grace ever time I visit your blog or anywhere you have card designs posted I am amazed by your designs. So much talent in such a sweeet amazing lady. Thank you for sharing your talents with all of us. Fabulous! I clicked on the frame right away to see the detail, it's amazing, I love the cross. What a wonderful gift this would make!! Lovely!! This card is beautiful. I love the way you embellished it. This is a beautiful work of art, it deserved to be framed, what a lovely gift it would make!! God bless you this New Year! This is so beautiful, Grace! I love the elegant color and punched lattice borders. Such a glorious framed image. Absolutely stunning! I'm so glad to be able to work w/ you here at ODBD. Happy New Year! Beautiful card, Grace. Love the punches, pearls and the colors too. Love the stamp set too. Wonderful work. Happy New Year. What an exquisite design, Grace. Love the subtlety of the color which focuses the eye on the image. Gorgeous. Amazing. Amazing detail. Just love it. What a work of art. I would love to have that on my wall. Wow, what an elegant card! :-) Happy New Year! This is breathtaking! This does belong in a frame! Just Beautiful!! Love ur work! !Happy new year!! WOW! This is one gorgeous piece of artwork! Gorgeous card - very worthy of framing. Beautiful project! I love learning new ways to use stamps. I really like the colors you used. Thanks for the tip letting us know to enlarge the photo to appreciate it's beauty. The camera may not have captured all the shimmer, but believe me, this project came across beautifully! This is just stunning. Just beautiful! I love how you put it into a frame too. The layers are great, and I'm now going back to look at it in the "large view"! I love the colors in this wall hanging...it would bring such a sense of peace to anyone looking at it on a wall! This is just exquisite and it certainly deserves a frame. How gorgeous! Really amazing! I would love to hang this on my wall! Beautiful! Worthy of being framed! Oh WOW!!! This is beautiful! Incredibly beautiful framing for this stamp and verse! Gee, I wish you had e-mail subscription to your blog! STUNNING, STUNNING, STUNNING Grace. You did a superb job on your creation!!! Grace, this is just beautiful. I love that your framed it too. It needs to be preserved! Your wall hanging is just beautiful! Love it. This is really pretty, love the colour choices and the details via the punching and pearls, looks lovely! Absolutely gorgeous! It reminds me of the intricate wood paneling carvings made in the middle ages. I got to visit the Met last spring, and one of the rooms (yes - ROOMS!) from an Italian aristocrat was on display with carving a lot like what you have created here. Beautiful! Grace, your framed artwork is SO beautiful! What a statement and a delight to the recipient! This card is exquisite!! Just beautiful!! WOW!! Absolutely beautiful! What a nice gift for someone! I love the sketch how you put them togther. I love your use of the punches and pearls, and I love the two-toned colors. It is very elegant. Wow!! This is amazing. Love it. wowza - this is stunning. Love the monocromatic look with tons of texture! This is so pretty! Thanks for sharing your talent with us. Grace: I LOVE that you framed this awesome piece of art! Absolutely gorgeous! Very beautiful. Love the lattice die, creamy & chocolate color pallete, & pearls. God bless & Happy New Year. Wow! How intricate. Very beautiful! This is just beautiful. Love the colors, and details you did one this project. Thanks for the inspiration. Stunning and the frame was made for it. What detail. I love the colors. Just beautiful! This would make a lovely remembrance for a Baptism or Confirmation. Wow! Very stunning and elegant! The frame is gorgeous, what a beautiful gift for someone celebrating a momentous occasion such as Baptism or Confirmation. Goodness! This is so lovely!! You really did a wonderful job on it!! Beautiful piece of art. Thank you for sharing. what an elegant piece of artwork! Beautiful. I looked at this and thought, "Oh wow, that is amazing!" What a stunning picture. Very vintage looking. I love it. WOW! This is a beautiful card! Thanks for the inspiration! Oh my goodness, the intricacy and delicate look of this card is breathtaking! Wow! The final result is so striking! Wonderful! I love the lattice look on the center section. Wow! What some people can do with their Nesties! I love this! I like the elegant card you made. Grace.....What a beautiful design and a wonderful gift idea. Thank you. Oh my goodness, what a beautiful project. Great layering ideas. Thanks! Oh how elegant and beautiful. This may be my favorite set. Love your design!! I love the Brilliance inks--I use them all the time!! Absolutely stunning and deserves to be framed and preserved. Love the intricate look. WOW! What a beautiful work of art! I love your music, too! You're inspirational. Oh, my goodness. This is over the top beautiful!!!! Grace your work is stunning. What a great idea! This set is perfect for a frame work of art. INCREDIBLE! This is such a beautiful piece and it really showed me how different components (not just ink), work so fabulously together. You have such patience! I am envious (I know, I work on it. )of your window view. Beautiful! Stunningly beautiful. Do not know that I could part with something so breathtaking, but it begs to be shared. Wow!This is breathtaking!! !I love it!! !God bless you in 2010!!!! It's not a card; it's a work of art. The platinum ink makes it look like so much more than mere paper. Thank you for sharing. What a treat to be looking at a beautiful piece of art that glorifies God while listening to the song Glory In The Highest by Chris Tomlin. Gorgeors and elegant!! Love the champagne color! P.S. I really like Ricky, too! This is absolutely beautiful! Love it! What a unique design; just beautiful. Beautiful piece - love the color, use of border pieces and pearls - oh my! TFS! Stunning!! - I love the subtilies in the colours here. TFS! I am glad you framed this project it is too breatiful not to keep. Well done. This is exquisite! Great project! Oh my, your project is stunning! Thanks so much for sharing! That's a stunning piece of art, it's awesome! Oh Grace, too bad there aren't cameras to capture glimmer...I love the platinum tone seen here, and what an elegant keepsake for a gift. Beautiful work, as always! Absolutely Beautiful - Thank you so much! Lovely-I've never used metallic inks! Fabulous! And this looks so great in the frame. I can only imagine how beautiful this must be IRL. Love it! What a beautiful piece you have created, Grace! Framed so beautifully and on display is exactly where it should be. What a wonderful framed project Grace - this is just beautiful! You have created a gorgeous project! It is very lovely! This is gorgeous! What a treasure it will be for someone special! Amazing, simply beautiful. Thanks for sharing. gorgeous card, bet it's more spectacular in person! thanks for sharing! Just beautiful! Smeone will really treasure this. Wow, this is gorgeous and so elegant,Your work is outstanding. It deserves to be framed as you have done. TFS. What a stunning card. Wow. I know what you mean about trying to capture pearl or glitter on camera. Your piece still looks beautiful. I can only imagine how beautiful it looks in person. Love this image for a framed picture! Your choice of paper and inks are so elegant and rich, what a wonderful gift to give someone special! Wonderful Job! Wow. Your work is amazing. The frame is perfect for it - just like you said. I enlarged it to see it closer and WOW. Fantastic. How Rich and Beautiful! Truly an amazing piece of Art to be displayed proudly and treasured forever. Just magnificent. such detail and beautiful work! Loved your work. Great ideas. Your creative juices are truly flowing with this card. Love it! Beautiful, Grace! This is perfect for framing! Thanks! What wonderful work. Would be perfect for a Bapptism, Confermation, Holy Communion. You are aptly named as you have recieved God's Grace of wonderous talent. Absolutely beautiful! It looks like a lot of work, but much fun! 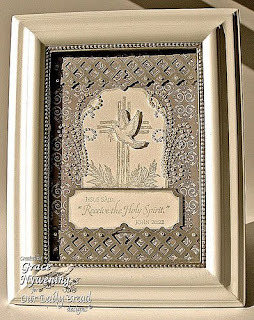 Just beautiful Grace - love your use of the pearls & punches. The soft taupe is so warm as well. Beautiful job. I love your work. Looks very time consuming but well worth the finished product!!! All I can say is WOW! I am in awe of your talent!! Just gorgeous! That is one BEAUTIFUL work of art. I love how it all came together. And loved your use of embellishments. WOW!!! this is just stunning!!! absolutely stunning. I truly have no other words for this piece of art!!! Oh what a beautiful keepsake this would make for a baptism or confirmation! Absolutely gorgeous!! Thank you for sharing! Thanks for sharing your talents your framed artwork is just Beautiful! Can't wait to order my stamps. I'm making them to give as gifts. Wow, what a great gift. Amazing what you can do with paper!! What a creative idea! Love it! Thanks for sharing! Just amazing. I had to stop and just stare at all the details. Thanks for your beautiful work. This is so pretty, it certainly deserves a frame. Thanks for your inspiration. I'm so glad I came back to check out your project (last week your site kept locking up my computer so I couldn't enjoy your wonderful creation!). It's so lovely! TFS! Oh my Grace, this card is a work of art! Your attention to detail, the colors you used, well, it is just breath taking!! So far, I think this is my favorite stamp! Thank you for sharing with us. Your artwork is a lovely display piece! Your card is beautiful...truly inspiring.